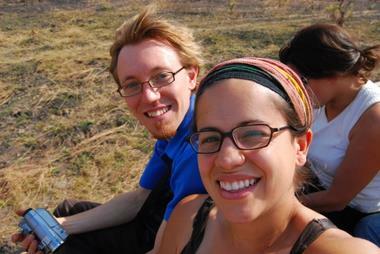 Shannon and I are in Ouagadougou, the capital city of Burkina Faso for a week right now. One of the missionary couples from Mahadaga, the village we’re stationed at, makes a trip here to the city each month to pick up supplies that are hard to find out in the village. Since we were part way here already for a missionary conference last weekend, we decided to come along into the city as well. The CSPS: The clinic where I (Shannon) work, ?called the CSPS, has been busy over ?this last month. It started with a team of ?surgeons who came to restore sight to ?the near blind. Performed under local ?anesthesia only, I was astonished at ?how quickly the surgeries made a difference. A day later and many of them ?could already see again! ? After the surgeries, the coming of ?“winter” brought with it the cool, dusty ?winds of the Harmatan (a seasonal wind ?blown in from the desert) causing many ?to become sick with bronchitis. Cooler ?weather also means more fires which ?has resulted in many badly burned children coming to the clinic. Every week I ?spend a lot of time doing dressings with ?meager supplies. Many wounds are ?terribly infected and often complex such ?as one young boy, Antoine, who has a ?wound of unknown origin from hip to ?foot and a man with gangrene on his ?face. Pray for wisdom! ? The CSPS services 26,000 people a ?year with few supplies and even fewer ?staff. The director of the clinic works 7 ?days a week and since there are no ?doctors, the nurses must diagnose and ?treat. The closest hospital is 60 km ?away (on bad roads) and there are few ?ways to transport patients. ?However, despite discouraging ?odds, the staff have great camaraderie ?and meet three times a week for prayer ?and Bible study. As well, the clinic pas?tor shares the Word of God with those ?who stay overnight in the clinic and he ?has seen many conversions! Many ?people travel far to come to this CSPS ?because of how they are treated. Also, ?unlike other clinics, if they cannot afford ?the treatment, they are not turned away ?here. Pray that this CSPS continues ?to be salt and light to the world ?around it! ?How Christmas was NOT like home: ? -Africans don’t decorate (we put snow- ?flakes on our door with pictures of snow ?in Canada and the children were per- ?plexed and mesmerized!) ? ?-People have rice and sauce with meat ?for a change– (eaten without cutlery) ? ?-Literally, NO advertising whatsoever ?-No boxing day shopping (bummer eh!?) ? How Christmas was kinda like at home: ? -We sang Christmas carols! 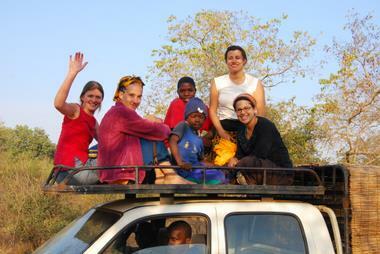 (although– ?while riding on top of a truck during a ?safari and looking for elephants!) ? we should do in advance. conference coming up in mid-January. continues his work on the database. he completes it in time! So for awhile, I had been wondering why it is that no one wears helmets while riding on the back of a motorbike. “It’s SO dangerous” I said, upon watching more than one motorbike almost wipe out with people, stuff, and goats on the back. 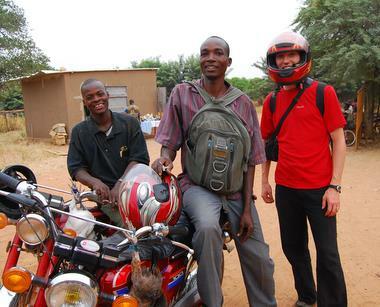 I was told that actually, it’s illegal not to have a helmet here in Burkina; the government made it mandatory. Except, I was told, no one obeys the law because helmets are too expensive. But actually now I know that that’s not the REAL reason that no one wears helmets. It’s because on a tiny seat, with two people crammed unconventionally together, there is no ROOM for too oversized plastic helmets. With every bump on the road it is nearly impossible to, as the passenger, NOT smack one’s forehead into the unsuspecting driver’s head. Our day in the bush villages surrounding Mahadaga, seeing some of the front line works of the Handicap Centre, was exciting, encouraging, and educating. The animateurs at the centre are like social workers, evangelists, and therapists all rolled into one. They visit handicapped children living with their families and do any range of things. Mostly, though, they pour out love and kindness on the children they visit, helping families understand that children who are handicapped are not worthless but are in fact priceless. They play games with mentally handicapped children, using simple tools to help them learn. They teach them how to dress or undress, or how to unwrap a candy and do functional things. They equip malformed children’s limbs with necessary apparatus’ and teach them how to walk again. They massage muscles that are weak and stiff from disuse or illness. They counsel families on how to care for these children, bring medicines for epileptics, and decide when or if that child can attend the school provided at the Centre. One animateur in particular captured our attention. His love, patience, and kindness to these children was captivating and a wonderful example of Christ. What a witness! It was neat to see the heart of this work, and to be reminded that the simplified paperwork resulting from Jason’s work will free up these animateurs to do more of this kind of work. Some highlights included: being given 3 chickens by 3 different families (we TRIED to give them back, but at least were successful in giving some to our animateurs!) We also got to see what their villages and home lives are like. 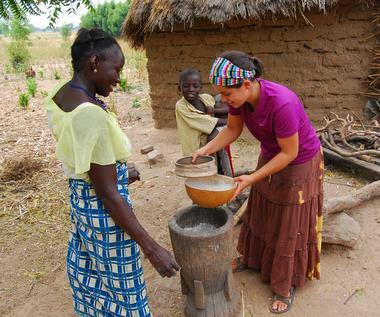 I got to pound out the millet like the women do. Most of the time on the back of the scooter I was afraid for my life, couldn’t find an appropriate way to sit with a skirt, and continuously searched for something to hold onto… but hey, I lived to tell about it! Guinea fowl, antelopes, and hippos- OH MY! After much deliberation, we decided to go along with some other short term missionaries here to see a local game park. This was their last chance to go and they needed extra travelers to make it worth the cost – so they twisted our arms to go (shucks). WHAT A DAY we had. It started at 3:30 in the morning. Yes. That’s A.M. With my coffee mug in hand (we’ll use that term loosely- it was a water bottle with a dishtowel and strips of cloth knotted around it to keep the coffee warm) we set out, 5 of us and the driver, crammed into a rickety truck. Not that the coffee did me any good. The CRAZY bumpy roads with acidic coffee in my tummy was more than a little nauseating. But then- mornings here really are beautiful so the cool air along the ride made up for it. 2 hours later, with it still being dark, we arrived at the gates of the animal park. We found out from the station that there weren’t many routes that could be taken in the park because the rainy season was profound and all the water ways had blocked the roads. We decided to risk it anyways. To our surprise, our driver (an employee at the Centre where Jason works) told us to mount on TOP of the truck. Yippee! That was definitely the highlight of the day. Watching the sun creep up the horizon, with cool air streaming over us, being tossed about and holding on for dear life on top of a truck! What fun! Every other minute we were shouting at each other “ATTENTION!” or “A gauche!” to inform each other to duck oncoming branches. We got to ride up on TOP of the truck! We drove around for hours until cold air turned to hot air and the sun was high above us (still only 10:30 in the morning). We sang, we chatted, we laughed. My favorite was our wave of Christmas music. Nothing like singing “Sleigh bells ring, are you listening…” and “Walking in a Winter Wonderland,” while riding the top of a truck and looking out over dry, hot African soil! However, we saw very few animals. 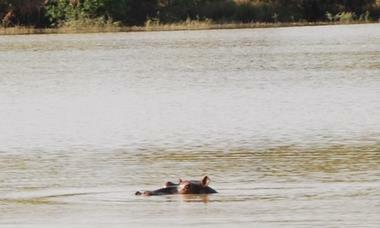 The highlight was the hippos which were really only eye-balls and ears swimming along a waterway off in the distance. We otherwise only saw guinea fowl, antelope, a wild bunny, and a few wild boars. Oh well! But, after my crazy ride home on top of the truck (stretched out flat, on my stomach, holding on for dear life with my arms reaching forward like superman) I ended up with a terrible sunburn on my back! I did however get a good view, had a few laughs, and got to ride through the busy marketplace and take some pictures! Our day didn’t end there, though, as it was only about 1 in the afternoon! One of the other missionaries arrived back from the capital with a HUGE truck of supplies they had shipped from the States. Jason worked on helping with some of that while I was trying to organize all the food supplies he also brought with him. Getting groceries for everyone here once a month is a bit of a nightmare organizationally! I had to try and figure out who got how many potatoes or tomatoes. AHH! After all that busyness I had yet to bake a cake and get ready for a Christmas party! The clinic where I work had a Christmas party and I got to wear my new tailor made African dress! The party was much different than we’re used to! We got there at 7 pm, more than a little tired and hungry, only to sit for 2.5 hours before dinner! We sang some songs, the director formally greeted everyone, handed out presents to staff, and the pastor did a whole sermon before we ate. The food made up for it though! We got to have our first REAL African meal of some couscous, chicken on the bone, and stew/curry. The women served everyone and of course, without cutlery. It was interesting eating hot food with your hand that’s for sure! (We both quietly wondered exactly how many chickens had to lose their lives for that meal to be made possible. The chickens here are very scrawny, so probably a LOT). After the meal and the desserts we and other missionaries provided, everyone dispersed. 11:30 pm and TIRED we finally got to crash. I was MORE than lathered in aloe vera because of my silly back burn but it WAS quite a day!